Hi there, my team mates over at Get Inky! are feeling rather patriotic lately and are posting their versions of the current challenge: Red, White, and Blue. Here is my twist on the project. I made a Victorian style inspired lace and paper cone which holds candies and a sentiment for the recipient. So it is like a gift and a card in one. To make the cone I simply took a double sided sheet of scrapbook paper which I trimmed down to an 8 inch square. I drew the top of a heart in the upper right hand corner to make the scallops. I trimmed the paper and put double sided tape along the left side straight edge. I shaped the paper into a cone and pressed down the opposite side to the taped side. I used a Doily about 8 " also and cut out the ;ace outer ring. By using a tacky glue on the inside of the cone and by slightly pleating the doily lace, i glued the lace to the inside top portion of the cone. Using a stapler and staples I affixed the tri colour ribbon to the top to act as a handle. with a piece of the doily centre I covered the base of the cone by gluing the white paper over the red paper. The front panel was made with white cardstock and a Stampin' Up! Sizzix Big Label Die cut. I had printed the Buzzing Bees Get Inky! by Blue Moon Creation digital on the card stock first. Afterwards I used Scor-Tape and extra fine micro glitter by Elizabeth Designs Monochromatic in warm tones. Finally, I coloured using some alcohol based markers. I hope you enjoy. Please visit the Get Inky! blog where I am on the Design Team and see other examples. 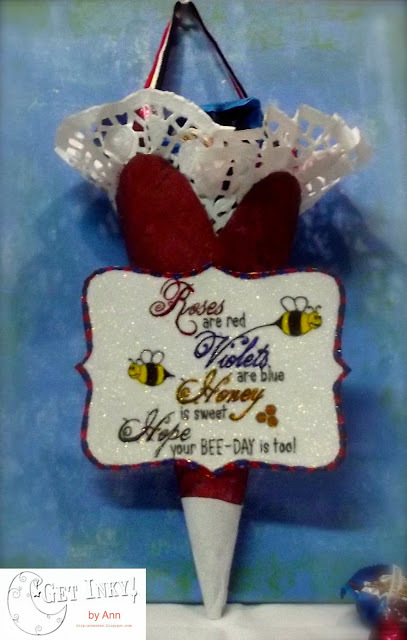 I am also entering this card/cone in the Red, White and Blue challenge at ABC Challenges, the Stamping Dragon., and Created With Love. I would so appreciate if you left me some comment loving too here at the bottom of my post as well as the Get Inky! blog. Don't forget you can follow me by checking in the Blog loving and follower tab on the left and right.